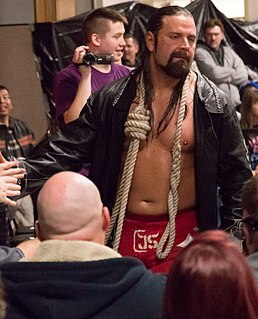 Kevin Scott Nash is an American professional wrestler and actor, currently signed to WWE. Global Wrestling Network (GWN) is a digital streaming service and mobile app owned by Anthem Wrestling Exhibitions, a subsidiary of Anthem Sports & Entertainment and parent company of Impact Wrestling. It primarily features content from the Impact video library, along with original programming and content from independent and international promotions. Gilbert Cosme is a Puerto Rican professional wrestler, better known by his ring names El Mesías, Mil Muertes, and Ricky Banderas. He began his career in the International Wrestling Association based in Puerto Rico. While performing in the company, he won the IWA World Heavyweight Championship on five instances and held minor championships on fifteen separate occasions, before leaving the company in 2006. On March 12, 2006, he debuted in Lucha Libre AAA Worldwide (AAA), a promotion based in Mexico, as a character named Muerte Cibernetica and was involved in an angle where this character was "killed". In November 2006, Cosme was involved in the tapings of the Wrestling Society X television series, where he was the second and last wrestler to win the WSX Championship. A narrative thread, or plot thread, refers to particular elements and techniques of writing to center the story in the action or experience of characters rather than to relate a matter in a dry "all-knowing" sort of narration. Thus the narrative threads experienced by different but specific characters or sets of characters are those seen in the eyes of those characters that together form a plot element or subplot in the work of fiction. In this sense, each narrative thread is the narrative portion of a work that pertains to the world view of the participating characters cognizant of their piece of the whole, and they may be the villains, the protagonists, a supporting character, or a relatively disinterested official utilized by the author, each thread of which is woven together by the writer to create a work. The match Kaz and Booker T versus Christian Cage and Robert Roode was also scheduled. On the November 15 episode of Impact!, Booker T, along with his real-life wife Sharmell, made their Impact! debut signing talent contracts. They were interrupted by Cage, sparking a rivalry between Booker T and Cage. On the November 29 episode of Impact!, Cage manipulated Roode into thinking that Booker T was trying to steal his spot at becoming a main star in the promotion. Roode went on to fight Booker T later in the episode in a losing effort. After the encounter, Cage and Roode attacked Booker T, which led Kaz to come to his aid in the situation. A tag team match between the four was later promoted by TNA for Turning Point. Another featured match on the card was a Six Man Tag Team Tables match pitting the teams of Johnny Devine and Team 3D (Brother Devon and Brother Ray) against Jay Lethal and The Motor City Machine Guns (Alex Shelley and Chris Sabin) (MCMG). On the October 18 episode of Impact!, Team 3D attacked MCMG and declared they were going to destroy the X Division to which they belonged. This was due to MCMG helping The Steiner Brothers (Rick and Scott Steiner) defeat Team 3D at TNA's Bound for Glory PPV event on October 14. The two teams then fought at Genesis with MCMG winning the contest. Later in the event, Team 3D attacked and stole the TNA X Division Championship from then-champion Lethal. On the November 15 episode of Impact!, Devine, an X Division wrestler, turned on the division and joined Team 3D, helping to attack MCMG and Lethal. A Six Man Tag Team Tables match was later added to the Turning Point card. 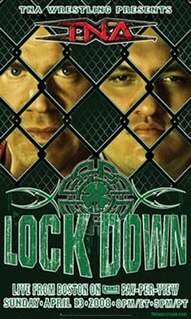 Lockdown (2005) was a professional wrestling pay-per-view (PPV) event produced by the Total Nonstop Action Wrestling (TNA) promotion, which took place on April 24, 2005, at the TNA Impact! Zone in Orlando, Florida. It was the first event under the Lockdown chronology and the fourth event in the 2005 TNA PPV schedule. Eight professional wrestling matches and one pre-show match were featured on the event's card. Every match took place inside a six sided steel structure known as the Six Sides of Steel. As a result, Lockdown was the first-ever all steel cage event held in professional wrestling. Slammiversary (2008) was a professional wrestling pay-per-view (PPV) event produced by the Total Nonstop Action Wrestling (TNA) promotion that took place on June 8, 2008 at the DeSoto Civic Center in Southaven, Mississippi. It was the fourth event under the Slammiversary name and the sixth event in the 2008 TNA PPV schedule. Seven professional wrestling matches and one dark match were featured on the event's card, three of which were for championships. The event commemorated TNA's six year anniversary. Victory Road (2008) was a professional wrestling pay-per-view (PPV) event produced by the Total Nonstop Action Wrestling (TNA) promotion that took place on July 13, 2008 at the Reliant Arena in Houston, Texas. It was the fourth event under the Victory Road name and the seventh event in the 2008 TNA PPV schedule. Eight professional wrestling matches were featured on the event's card, three of which were for championships. No Surrender (2008) was a professional wrestling pay-per-view (PPV) event produced by the Total Nonstop Action Wrestling (TNA) promotion that took place on September 14, 2008 at the General Motors Centre in Oshawa, Ontario, Canada. It was the fourth event under the No Surrender name, TNA's first PPV to take place outside the United States, and the ninth event in the 2008 TNA PPV schedule. Nine professional wrestling matches were featured on the event's card, four of which were for championships. Destination X (2008) was a professional wrestling pay-per-view (PPV) event produced by the Total Nonstop Action Wrestling (TNA) promotion, which took place on March 9, 2008, at the Norfolk Scope in Norfolk, Virginia. It was the fourth event under the Destination X chronology and the third event in the 2008 TNA PPV schedule. Eight professional wrestling matches were featured on the event's card, two of which involved championships, while one match was held prior to the event. Genesis (2007) was a professional wrestling pay-per-view (PPV) event produced by the Total Nonstop Action Wrestling (TNA) promotion, which took place on November 11, 2007, at the TNA Impact! Zone in Orlando, Florida. It was the third event under the Genesis chronology, the last held in the month of November, and the eleventh event of the 2007 TNA PPV schedule. Eight professional wrestling matches were featured on the event's card, four of which were for championships. Final Resolution was a professional wrestling pay-per-view (PPV) event produced by the Total Nonstop Action Wrestling (TNA) promotion, which took place on January 6, 2008 at the TNA Impact! Zone in Orlando, Florida. It was the fourth event under the Final Resolution chronology; the first of two Final Resolution events held in 2008 and the last event held in January. It was the first event in the 2008 TNA PPV schedule. Eight professional wrestling matches were featured on the event's card, three of which involved championships. 1 2 3 "Turning Point 2007 at Pro Wrestling History". Pro Wrestling History. Retrieved 2011-03-11. ↑ "Anthem, Impact announce Global Wrestling Network launch" . Retrieved 20 March 2018. ↑ Martin, Adam (2007-09-16). "'Monster's Ball' at Bound For Glory, upcoming PPV schedule + TNA Today". WrestleView.com. Retrieved 2011-07-20. ↑ Martin, Adam (2007-10-07). "TNA set to possibly run another PPV outside Orlando to close 2007; more". WrestleView.com. Retrieved 2011-07-20. ↑ Martin, Adam (2007-10-17). "TNA takes over WWE PPV dates, Turning Point, & Genesis PPV on 11/11". WrestleView.com. Retrieved 2011-07-20. ↑ Martin, Adam (2007-11-12). "TNA Knockout passes out at Genesis PPV, replay times, & 'Turning Point'". WrestleView.com. Retrieved 2011-07-20. ↑ Martin, Adam (2007-11-27). "Booker T on what made him leave WWE, Leticia Cline, Turning Point note". WrestleView.com. Retrieved 2011-07-21. ↑ Grabianowski, Ed. "How Pro Wrestling Works". HowStuffWorks, Inc. Discovery Communications . Retrieved 2014-03-02. 1 2 3 4 Caldwell, James (2007-11-15). "Caldwell's TNA Impact report 11/15: Ongoing "virtual time" coverage of two-hour show". Pro Wrestling Torch. Retrieved 2011-07-21. ↑ Caldwell, James (2007-11-08). "Caldwell's TNA Impact report 11/8: Ongoing "virtual time" coverage of two-hour show". Pro Wrestling Torch. Retrieved 2011-07-21. 1 2 3 4 Sokol, Chris (2007-11-12). "Booker T the surprise, but Angle still champ after Genesis". Canadian Online Explorer . Retrieved 2011-07-21. 1 2 3 Sokol, Chris (2007-11-16). "Impact: Kaz gets his title shot". SLAM! Sports: Wrestling. Canadian Online Explorer . Retrieved 2011-07-21. ↑ Keller, Wade (2007-11-29). "Keller's TNA Impact report 11/29: Ongoing "virtual time" coverage of show with Booker T's first promo". Pro Wrestling Torch. Retrieved 2011-07-21. ↑ Sokol, Chris (2007-12-01). "Impact: Alliances end and are formed". Canadian Online Explorer . Retrieved 2011-07-21. ↑ Caldwell, James (2007-10-18). "Caldwell's TNA Impact report 10/18: Ongoing "virtual time" coverage of two-hour show". Pro Wrestling Torch. Retrieved 2011-07-21. ↑ Keller, Wade (2007-10-14). "Keller's TNA Bound for Glory PPV report 10/14: Ongoing "virtual time" coverage of live event". Pro Wrestling Torch. Retrieved 2011-07-21. 1 2 3 Keller, Wade (2007-11-22). "Keller's TNA Impact report 11/22: Lots of slapstick comedy and a really good main event". Pro Wrestling Torch. Retrieved 2011-07-21. ↑ Keller, Wade (2007-11-11). "411's LIVE TNA Genesis '07 Coverage: SHOP OF HORRORS MATCH: Abyss vs. Black Reign". 411mania.com. Retrieved 2011-12-27. 1 2 3 Martin, Adam (2007-12-02). "Turning Point PPV Results - 12/2 - Orlando, FL (Six Man Tag and more)". WrestleView.com. Retrieved 2011-07-21. ↑ TNA Home Video and Navarre Corporation (2007-12-02). "Turning Point 2007". TNA Turning Point. In Demand. 1 2 3 4 5 Sokol, Chris (2011-04-11). "Chaos rules at Turning Point". SLAM! Sports: Wrestlling. Canadian Online Explorer . Retrieved 2011-07-21. 1 2 3 4 Keller, Wade (2007-12-02). "Keller's Turning Point PPV report 12/2: Ongoing "virtual time" coverage of live event". Pro Wrestling Torch. Retrieved 2011-07-21. 1 2 3 Caldwell, James (2007-12-02). "Caldwell's TNA Turning Point PPV report 12/2: Ongoing "virtual time" coverage of live PPV". Pro Wrestling Torch. Retrieved 2011-07-21. 1 2 3 Martin, Adam (2007-12-03). "Rhino out of action with legit neck injury, PPV injuries + Final Resolution". WrestleView.com. Retrieved 2011-07-21. 1 2 3 Keller, Wade (2007-12-07). "Keller's TNA Impact report 12/6: Ten-man tag main event, Team 3D & Devine vs. Machismo & Guns in ladder match". Pro Wrestling Torch. Retrieved 2011-10-31. 1 2 3 4 5 6 Xamin, Mark (2008-01-07). "Styles sides with Angle costing Cage at Final Resolution". SLAM! Sports: Wrestling. Canadian Online Explorer . Retrieved 2011-10-30. 1 2 3 4 5 Sokol, Chris (2008-02-11). "Against All Odds: Angle still TNA champ". SLAM! Sports: Wrestling. Canadian Online Explorer . Retrieved 2011-10-31. 1 2 3 Keller, Wade (2007-12-16). "Keller's TNA Impact report 12/13: Christian looks for partner, Briefcase Contents Revealed, TNA wrestler fired". Pro Wrestling Torch. Retrieved 2011-10-31. ↑ Clevett, Jason (2008-03-10). "Destination X spotty at best". SLAM! Sports: Wrestling. Canadian Online Explorer . Retrieved 2011-10-31. 1 2 Sokol, Chris (2008-04-18). "TNA Lockdown:Joe captures gold". SLAM! Sports: Wrestling. Canadian Online Explorer . Retrieved 2011-10-31. ↑ Keller, Wade (2007-12-26). "Keller's TNA Impact report 12/20: Christmas-themed episode ends with Styles vs. Kaz in reindeer ladder match". Pro Wrestling Torch. Retrieved 2011-10-31. 1 2 Keller, Wade (2008-01-05). "Keller's TNA Impact report 1/3: Four Gauntlet Matches, Styles's Conundrum, Final Resolution Hype". Pro Wrestling Torch. Retrieved 2011-10-31. ↑ Keller, Wade (2008-01-12). "Keller's TNA Impact report 1/10: Kim vs. Kong for Title, Styles becomes a Prince, Marlena the Rat". Pro Wrestling Torch. Retrieved 2011-10-31. ↑ Caldwell, James (2008-04-17). "Caldwell's Impact report 4/17: Ongoing coverage of Spike TV show". Pro Wrestling Torch. Retrieved 2011-10-31. ↑ Sokol, Chris (2008-05-13). "TNA Sacrifice: Joe retains; LAX regains". SLAM! Sports: Wrestling. Canadian Online Explorer . Retrieved 2011-10-31. ↑ Keller, Wade (2008-01-20). "Keller's TNA Impact report 1/17: Styles vs. Joe vs. Christian, ODB vs. Angelina, Stone Cold Shark". Pro Wrestling Torch. Retrieved 2011-10-31. ↑ Keller, Wade (2008-01-25). "Keller's TNA Impact report 1/24: Guns vs. Team 3D vs. Tomko & Styles, 2007 TNA Awards, Stone Cold Shark". Pro Wrestling Torch. Retrieved 2011-10-31. ↑ Sokol, Chris (2011-04-11). "Samoa Joe finally tops Angle at Turning Point". SLAM! Sports: Wrestling. Canadian Online Explorer . Retrieved 2011-10-30. ↑ Kapur, Bob (2011-04-11). "Edge brings in the clones to win at Armageddon". SLAM! Sports: Wrestling. Canadian Online Explorer . Retrieved 2011-10-30. ↑ "Total Nonstop Action Wrestling Presents: Turning Point 2007". For Your Entertainment. Archived from the original on 2012-04-06. Retrieved 2011-10-30. 1 2 Martin, Adam (2007-12-03). "More on Scott Hall no-showing PPV, Samoa Joe upsets some with promo". WrestleView.com. Retrieved 2011-11-01. ↑ Martin, Adam (2007-12-03). "TNA holds meeting with all talent today, one star quits the company, info". WrestleView.com. Retrieved 2011-11-01. ↑ "Samoa Joe Speaks On Lockdown Title Shot". Total Nonstop Action Wrestling . web.archive.org. 2008-02-22. Archived from the original on 2008-04-30. Retrieved 2011-11-08. ↑ Sokol, Chris; Sokol, Bryan (2008-10-15). "Sting takes title at Bound for Glory". SLAM! Sports: Wrestling. Canadian Online Explorer . Retrieved 2011-11-01. ↑ Keller, Wade (2008-11-09). "Keller's TNA Impact report 10/30: Scott Steiner joined the MEM, Angle vs. Abyss, Nash & Booker vs. Styles & Joe, Turning Point hype". Pro Wrestling Torch. Retrieved 2011-11-13. ↑ Sokol, Chris; Sokol, Bryan (2008-11-10). "Turning Point: Mafia gains momentum". SLAM! Sports: Wrestling. Canadian Online Explorer . Retrieved 2011-11-01. ↑ Sokol, Bryan (2011-04-11). "Sacrifice: Sting the new face to Main Event Mafia". SLAM! Sports: Wrestling. Canadian Online Explorer . Retrieved 2011-11-01. ↑ Martin, Adam (2007-12-03). "Backstage news on why Scott Hall missed TNA's Turning Point PPV, more". WrestleView.com. Retrieved 2011-11-01. ↑ Cohen, Eric. "TNA PPV results". Prowrestling.About.com. Retrieved 2011-07-21.